Mexican President Felipe Calderón met yesterday with Secretary General of the Organization for Economic Cooperation and Development José Ángel Gurría at the official Los Pinos residence. During the meeting, the president and Secretary General Gurría discussed the global economic situation and shared their concern over the lack of swifter, more decisive actions in various parts of the world to reduce the uncertainty and volatility of international markets and to establish forceful measures to restore growth and jobs. Secretary General José Ángel Gurría highlighted the importance of the collaboration between the Organization for Economic Cooperation and Development and the Mexican public sector in order to promote Mexico’s economic, social and sustainable development. Within this framework, he mentioned the organization’s support of the structural reforms promoted by President Calderón’s government in regard to competition, deregulation and the business environment, educational reform and the fight against corruption, among other aspects. Secretary General Gurría gave President Calderón a document entitled “OECD Perspectives Mexico,” a review of Mexico’s advancements and challenges in various areas of public policies crucial to economic development. This document was drawn up with the participation of the president’s offices. It was also agreed to continue the collaboration agenda between Mexico and the OECD, including the production of various studies such as a state index on the rule of law and security. The Secretary General of the Organization for Economic Cooperation and Development highlighted the leadership Mexico will exercise when it chairs the G-20 this year, which will see major challenges in regard to the economy, society and global governance. He also hailed Mexico’s valuable work in placing the green growth agenda on the international agenda. President Calderón concluded by thanking the Organization for Economic Cooperation and Development for its support and trusted that the contributions of this international organization will continue to be important and timely for Mexico. 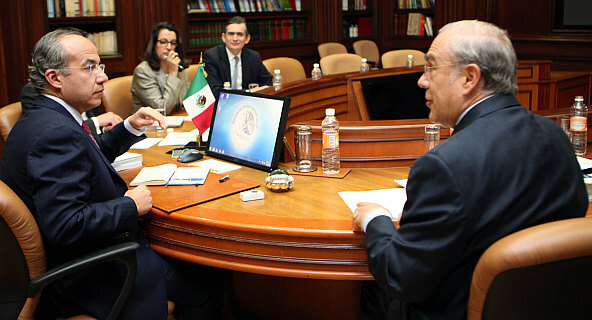 President Calderón was accompanied by Under-Secretary of Foreign Affairs Lourdes Aranda.